I've decided to build a GPS receiver for my ICOM IC-9100. No particular reason other than I was looking for an electronics project and this one seemed to have enough complexity (which would be VERY little to others, but a LOT for me!) to make it interesting and fun. 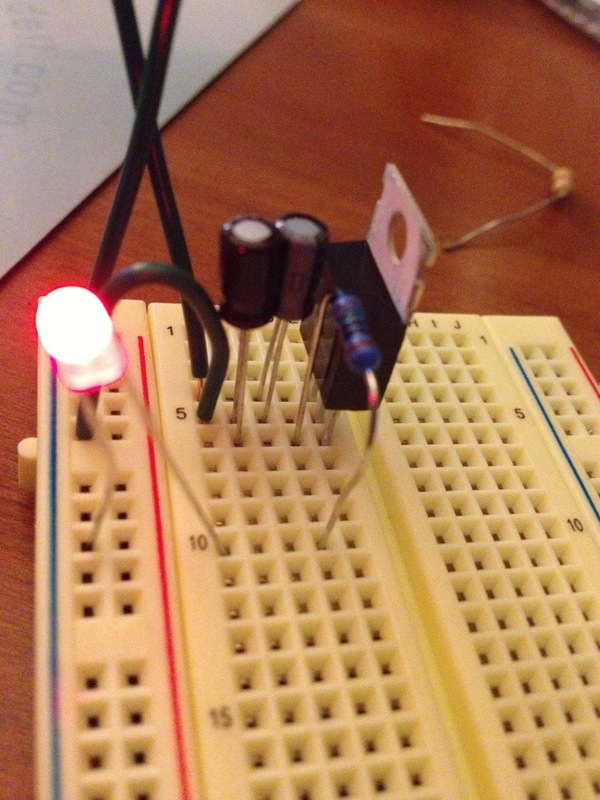 I created an account on Circuit Lab and designed my 1st circuit. Actually, I really designed it on a sheet of paper and after editing, and editing, and editing... I decided to look for an online way of designing a circuit - I Googled circuit design and Circuit Lab popped up - I created an account and started. It seems pretty simple, which is exactly what I'm looking for right now. As you can see, the LED is lit and the voltages are all pretty much right where they are supposed to be! I'm pretty excited - this is the first time that I actually designed a circuit with a voltage regulator, couple of capacitors, and an LED. AND it WORKS!!! Woo Hoo!!! The GPS draws 100mA and the LED is 20mA. I saw the 100mA 78L05 and thought that it might just not regulate the correct/proper amount of current. I thought about it though!!! The capacitors are 0.33uF and 0.1uF. I don't have any idea what the "proper" sizing for those are supposed to be; these seemed to be "common" sizes based upon a number of different circuits I saw. Good job Jim. It is always fun when one makes their first "working" circuit. I have seen many give up because they didn't understand how they "smoked" their components or popped an LED. Adding an LED makes it even nicer to know the circuit is active. My only recommendation is possibly add a 100 uF to 300 uF capacitor on your regulator output. It will act as a shock absorber ,help filter out surges on the supply when you turn a piece of equipment on and off. This is especially so if you plan on turning relays on and off.